Although dogs pay the ultimate price, the discrimination in breed specific legislation is often aimed at people. And they suffer, too. The City of Montreal has sent a letter to as many as 500 families who live with pit bulls telling them they have only a couple of weeks “to find their dogs new homes in towns where the breed isn’t outlawed or surrender the dogs to animal shelters” where they will be killed. What makes this especially tragic is that no one really expects the law to reduce dog bites. Virtually every study that has looked at them found that dogs targeted for breed discriminatory laws were not more likely to bite, did not bite harder, and the laws did not result in fewer dog bites or bite-related hospitalization rates. In fact, they make things worse, often resulting in a greater number of overall bites (as officials tasked with preventing bites focus on the irrelevancy of what dogs look like and encourage people to ignore warning signs in non-legislated breeds which lead to avoidable bites). After neighboring Ontario banned pit bulls, for example, thousands of dogs and puppies have been “needlessly put down” according to the Ontario Veterinary Medical Association. At the same time, “Toronto’s reported dog bites have been rising” and “reached their highest levels this century” even as pit bulls are being exterminated. Going to someone’s house, knocking on the door, and seeing their American pit bull terrier sitting in their living room watching television with the rest of the family, and have to take it out. Where the dog has done nothing wrong, no problems, but just because [of] its breed, he has to be removed. The roots of Miami-Dade’s pit bull ban was growing anxiety and social tension about Cuban immigration. Denver’s ban was enacted after the energy industry bust resulted in “migration [that] dramatically changed the population of the city”: whites moved out and Latinos moved in. When Aurora, CO, enacted a ban, one of the commissioners stated that she did not want “those sorts of people” moving into her community. When then-Mayor Ed Koch sought similar measures in New York City, he did not do so because of evidence that the dogs were dangerous but because “of who was thought to own them.” In Sterling Heights, MI—a sundown town that once excluded African Americans—a supporter of the pit bull ban called it necessary because, “We have inner-city people who bought homes here.” In Ellenville, NY, officials did not even bother using coded language. They wanted BSL to address the growing number “of Mexicans moving into the community.” In short, says one target of the ban, “it seems that ‘pit bull’ has become a synonym for ‘black.’” Not surprisingly, support for BSL remains strongest with older, white, and more conservative voters and in predominantly white suburbs. This isn’t limited to the U.S. In the U.K., the ban on pit bulls was not because they bit disproportionately to other dogs (to the contrary in fact); pit bulls were picked specifically because of race. The dogs most correlated with dog bites were supported by what Kenneth Baker, the then-Home Secretary in Margaret Thatcher’s government, called the “kennel club” types: wealthy, white, and conservative; Thatcher’s constituency. With pressure to do something, Baker admitted that “social class” and what he termed “optics” played a role in choosing to target pit bulls. In antebellum America, the least powerful were African slaves. Among the planter class, it was accepted as a foregone conclusion that dogs owned by slaves were most likely to attack sheep and cause general mayhem around the estate. ‘It is not for any good purpose Negros raise, or keep dogs, but to aid them in the night robberies, George Washington wrote to a friend in 1790. Any of Washington’s slaves who was found with a dog was severely whipped, the dog hanged. Thankfully, more and more communities are repealing breed specific laws, especially with turnover on city councils or county commissions. But sometimes they do not. Once passed, it sometimes proves difficult to repeal a ban without appearing indifferent to public safety simply because of the argument—repeated ad infinitum—that these dogs are dangerous, even when there is no legitimate proof of this claim. 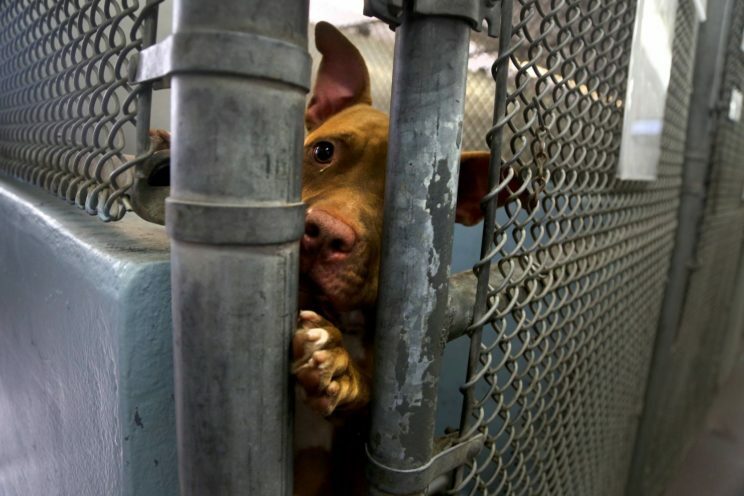 In places like Miami, it is easier to simply maintain the status quo, regardless of the cost in animal lives. Moreover, those who introduce pit bull bans and restrictions, vote for them, enforce them, or defend them are provided political cover by a small, but vocal, group of disinformation peddlers who give their untoward actions the false stain of legitimacy. And who did the puppy mill industry cite as a source for its claim that pit bulls are jihadi terrorist-like dogs? Merritt Clifton. Tragically, however, he’s not the only one. PETA has joined Clifton’s witch hunt by arguing that all pit bulls in all shelters should be killed: “Most people have no idea that at many animal shelters across the country, any pit bull that comes through the front door doesn’t go out the back door alive,” writes PETA founder Ingrid Newkirk. From San Jose to Schenectady, many shelters have enacted policies requiring the automatic destruction of the huge and ever-growing number of ‘pits’ they encounter. This news shocks and outrages the compassionate dog-lover. Here’s another shocker: People for the Ethical Treatment of Animals, the very organization that is trying to get you to denounce the killing of chickens for the table, foxes for fur or frogs for dissection, supports the shelters’ pit-bull policy… People who genuinely care about dogs won’t be affected by a ban on pits. I did witness [PETA] bring back a pit bull to the Norfolk location. This pit bull was wagging its tail, jumping (an obvious friendly dog; not feral) while receiving praise, treats and getting pet by the [two PETA] employees. It was the end of my shift, so I was cleaning and restocking, which required me to go into their shed for supplies. I saw the [two PETA] employees take the pitbull into the shed’s euthanasia room, which is inside this shed. It is a small room where they have a table and a huge walk-in freezer with [four] large trash cans. The trash cans contained deceased animals and were usually full. As I continued to do my job, I heard the [PETA] employees talking to the dog and trying to calm it down as it whined. Later … they opened the door and I saw the pit bull deceased on the table. Not surprisingly, PETA specifically targets vulnerable and disadvantaged populations through its “Community Animal Project” in order to kill their dogs. According to an affidavit filed in a recent court case, “The main purpose of the Community Animal Project was to persuade people to surrender their animals, so that PETA could then euthanize the animals.” This included lying, trespassing, trapping, and stealing animals to kill. According to PETA employees who have spoken out, PETA argues that since these people cannot adequately take care of animals, animals are better off dead, which PETA is willing to do. When PETA was recently caught stealing and killing a family’s dog, it focused on a trailer park where the population was largely poor, immigrant, Spanish-speaking, and possibly undocumented. Although it was sued and was forced to settle the case for $49,000, it unsuccessfully tried to defend itself by seeking information as to the family’s immigration status under the implied argument that people in this country illegally do not deserve dogs or, at the least, stealing and killing their dogs should not be actionable in court, even though the killing of the dog was no accident. PETA routinely kills or causes to be killed over 90% of animals it seeks out: as high as 98% of all animals. Many of these are from neighborhoods deemed undesirable by the men and women who—indifferent to the pain they cause families—PETA hires to go into poor neighborhoods to round up and kill their animals. There are the “experts” pit bull ban proponents use as a “race-neutral” cover to justify their deadly actions. And the list of victims includes both dogs and the people who love them. The fact that breed discrimination does not work and is not designed to adds insult to the injury suffered by hundreds of Montreal families who must face the specter of knocks on their door, officers taking their beloved family members, and then having to go to the pound to pick them up in body bags. It likewise adds insult to the thousands of dogs who will be killed year after year for reasons which have nothing to do with their behavior. And it ultimately begs the question: if diversity is Canada’s strength—as Canadian Prime Minister Justin Trudeau has stated on more than one occasion—why is it employing racist policies to kill family dogs? And why is it hiding behind race-baiting academic imposters, charlatans, and in the case of PETA, what is almost certainly a death cult, to do so? Coleman, Stacey, Personal Communication, Animal Farm Foundation (Aug. 30, 2017). Greenwood, Arin, Dear PETA: Dogs Respond To PETA Joining Terrible Anti-Pit Bull Coalition, The Huffington Post (Oct. 19, 2015). In addition to the above, sources include court records from the lawsuit against PETA by the family of Maya, a dog they stole from her porch and killed (Wilbur Zarate Llaven vs. People for the Ethical Treatment of Animals), personal communications with PETA employees conducted between 2015-2017, and annual disposition statistics reported by PETA to the Virginia Department of Agriculture & Consumer Services. These documents can be found at nathanwinograd.com and whypetakills.com.